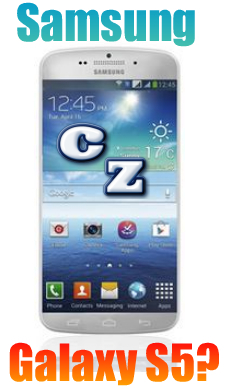 Samsung Galaxy S5 Rumor Watch Begins! Well folks, it's time for me to start reporting on the rumors of "The Next Big Thing" by Samsung, the Galaxy S5 smartphone. It's gonna drop sometime in the spring of 2014, so let's get this rumor roundup started and see how accurate my guesswork pans out to be! I'll run through all the worthwile details that the rumor mills are sharing, and give you my thoughts on whether or not I think they will have a chance of becomming reality on release day. It's gonna be bigger. That is a foregone conclusion. The tech blogs are saying it will sport a 5.2" diagonal, and that's pretty realistic. They might be able to get that slight increase just by reducing the bezel and stretching out to the limits of the case. 1080x1920 resolution with 423ppi is the call, and I think this is entirely reasonable aso. I don't think this will be the upcomming flexible OLED display, but it will be the best we've ever seen from Samsung. Count on that! The Galaxy S5 will more than likely be made from the same lightweight plastic material that we've seen thus far. I don't believe Samsung is ready to dump what has worked for them thus far, just because there are heavier smartphones on the market that are made of glass, metal, or polycarbonate material. I hope this is the plan, because this makes the handset far more durable, and it will survive drops much better than its heavier competitors. I'm calling this a foregone conclusion also. Why? Because it's already on the iPhone 5S. The market for fingerprint recognition is heating up, and "biometric security" is where everything is headed in tech. I think there will be a slight chance that Samsung will "one-up" Apple by burying their fingerprint detector under the screen, which would keep the surface perfectly flat. Look for a Quad Core 32-bit Snapdragon 800 under the hood of the Galaxy S5, which will be supplied "in-house" from Samsung itself rather than outsourcing to other CPU suppliers. This is in line with the natural progression of smartphone processing power, and will bring it to the next level of multitasking capability and speed of operation. The processor will be supported by 3Gb of RAM, which again is what we would expect. The rumor mills mostly agree that we will see a 16MP rear camera and a 2MP front facing camera in the Galaxy S5. I would bet that the camera capability will be that of the current Galaxy Note III, but possibly with more advanced special effects and picture taking options. I'm hoping it will be a serious improvement over the camera in the Galaxy S4, though. All of the crazy extra gimmicks and tricks that came with the Galaxy S4 will probably be carried over to the Galaxy S5, but rumor has it that they will be adding 3D gestures into the mix. I found most of the crazy extras that were packed into the TouchWiz 4.0 overlay to be quite useless, but a few were really useful. I'm hoping the new tricks will have real utility. Many blogs are reporting that Samsung will release a "standard" and an "advanced" model of the Galaxy S5. I'm not completely convinced of this yet. The reason being is that Samsung has stuck to the formula for providing a standard price mainline Galaxy smartphone while the Note series carries a higher price tag thanks to the extra digitizer layer for the S Pen. But anyhow, word has it that the standard model will only have 2Gb of RAM (I don't believe that) while the advanced model will get 3Gb plus a display with an even higher resolution and pixel density. I don't see the masses paying extra for that, but we'll see. My prediction is that Samsung will keep the options tight. The only realistic scenario I see for a higher priced version would be for one that has more flash memory, similar to what we see with the iPhone line. The company has so many handsets out on the market, I just don't see why they would splinter their flagship smartphone into too many variations. My biggest struggle will be staying content with my Galaxy S4 when this is released. My bonus prediction? I sell my S4 on eBay before the end of May and scrounge up the extra cash to buy a Galaxy S5 straight-out. Then I pout and whine when the Galaxy Note 4 is released shortly after I drop the load. Stay tuned and we'll watch for more developments on what this thing will actually look like, along with a firm release date. What would YOU like to see in the Galaxy S5? Shout it out!